The cast and crew of the new Han Solo movie began shooting on February 20 at Pinewood Studios, London. StarWars.com’s first major announcement regarding the new film revealed our first glimpse of the newly assembled cast. Though unfortunately not in costume. For most of us two names jumped off the list. Woody Harrelson and Emilia Clarke. Harrelson, whose back catalog includes The Hunger Games, Kingpin, Money Train and Natural Born Killers is surely the most surprising inclusion. It’s fair to say that Harrelson probably wasn’t on most people’s list of candidates to join the Star Wars canon, given his gory movie history. But perhaps two factors have worked in his favour. The biggest being his renaissance in the hugely successful Hunger Games franchise, which managed to remind many of us of his charismatic abilities and also to introduce him to a new generation of moviegoers. But the second lies in the nature of the singular Star Wars story (SWS) movies. Because we can’t go on a journey with these characters and build a relationship as we did in the past, the SWS movies need recognised actors to carry the heftier roles. Mads Mikkelsen and Forest Whitaker for example from Rouge One. This a smart move from Disney. Sooner or later the movie going public, not fans, will begin to tire of yet another Star Wars film. So using named actors will certainly help promote the film and draw in the box office sales. Emilia Clarke’s introduction however, is marketing genius. There can’t be many hotter names in Hollywood right now after starring in the already HBO classic Game of Thrones, and her inclusion is guaranteed to return her fee many, many times over at the box office. Indeed, Emilia does remind me of a young Carrie Fisher. Like Carrie, Emilia can credibly portray characters of immense personal character with an iron will to match, despite their petite physical stature. We know a lot more about Leia’s back story than Han’s. Hence Han now getting his own movie. But seeing Emila in the shot with Alden Ehrenreich does make think that a movie with a young Leia might not be out of the question at some point in the future. Alden isn’t Harrison Ford and Emilia isn’t Carrie Fisher. But just maybe, and what a tribute that would be. So who plans to rub shoulders with Woody and Emila at Star Wars Celebration in 2018? I’m in! 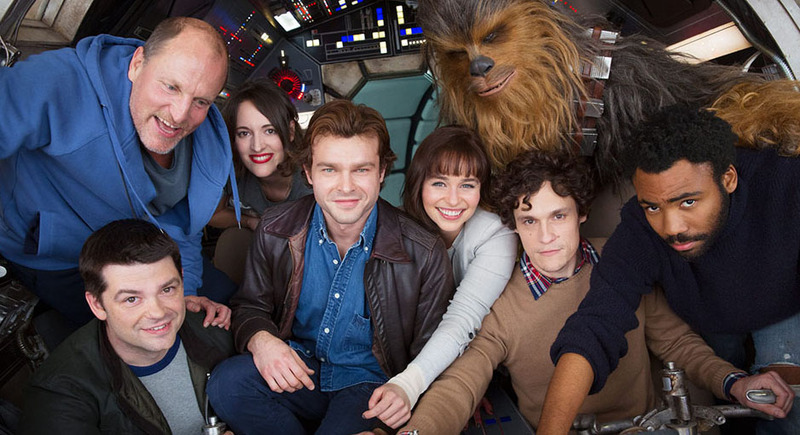 Phil Lord and Christopher Miller are directing the movie, with a cast that includes Alden Ehrenreich as Han Solo, Woody Harrelson, Emilia Clarke, Donald Glover as Lando Calrissian, Thandie Newton, and Phoebe Waller-Bridge, with Joonas Suotamo as Chewbacca.